This pear arugula salad is so delicious and healthy, I prepared it in just a few minutes too. I served it with my favorite homemade lemon dressing. The combination of fresh flavors has that perfect amount of sweet and tanginess, without going overboard. I think this salad has summertime picnic written all over it, and also goes well with meats, such as a steak. When I eat steak I love to feel guilt free about it, so having a nice salad like this one helps in that department. Hope you’ll enjoy this Pear Arugula Salad with Homemade Lemon Dressing recipe. In a mixing bowl, whisk lemon juice, olive oil, black pepper, dijon mustard and agave nectar until well blended. Serve immediately or store in an airtight jar. Refrigerate for up to 2 days. In a salad bowl or salad serving plate, arrange all the ingredients in layers. Serve with fresh homemade lemon dressing. Arugula is a great type of lettuce to use and you can make it as simple or choked full of other great stuff. I love to add walnuts as well. This really sounds like a light type of salad to eat up mid day for a little boost. I will try to make it, never had arugula before! Pears are a nice addition to any salad! I’ve been eating them with my greek yogurt for snacks lately. This sounds like a great salad for the summer. It seems light and refreshing and not heavy at all. This recipe is something that the family will love. I should bookmark and prepare this this weekend. This recipe sounds so tasty! I love arugula and I can imagine pear would be great with it! It does look like quite a yummy salad here. 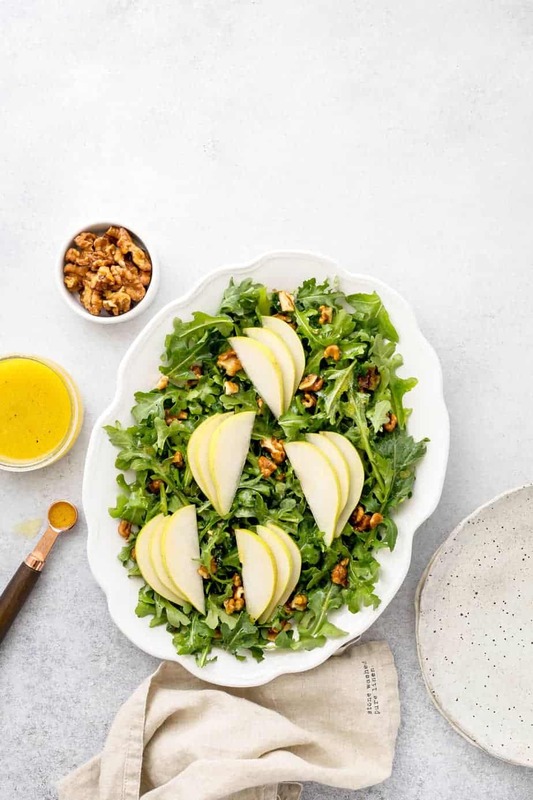 The pear and the nuts with the arugula look amazing. The lemon dressing sounds good with it as well. Oh my word! It is s many of my favorite things in one salad! I love that you did the pears and the nuts, it is the perfect touch! Mmmm, my hubby makes us salad that is very similar to this! It’s my favorite in the spring–so fresh and delicious! 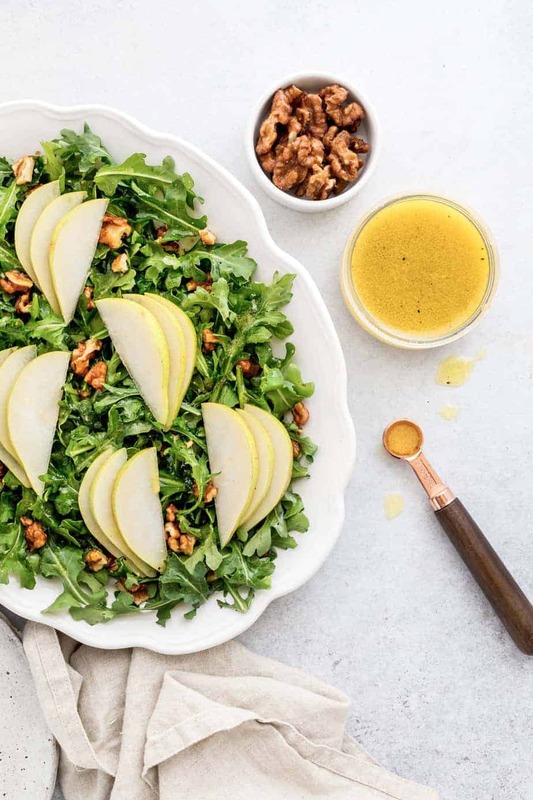 Pear Arugula Salad with Lemon dressing is something I would love to try. Salads are something my family loves to eat at lunch and dinner so having new recipes is a great thing for us. Thanks for sharing the recipes. That pear salad screams “Spring” to me. Very light with the lemon dressing. I would serve it with fish or just eat it alone. Yum! I need to make a pear salad. During the summer we try not to heat up the kitchen for dinner. This would definitely be a dinner my family would enjoy. The vinaigrette sounds delicious. I need to eat more healthy foods like this. I have yet to try pear salad but I prefer to eat pears straight up :-D.
Wow, this sounds really great! I love the idea of the sweetness of the pear combined with the little spice of the arugula! Oh yum! A new salad to try! I find myself eating more salads this year and your recipe looks amazing.